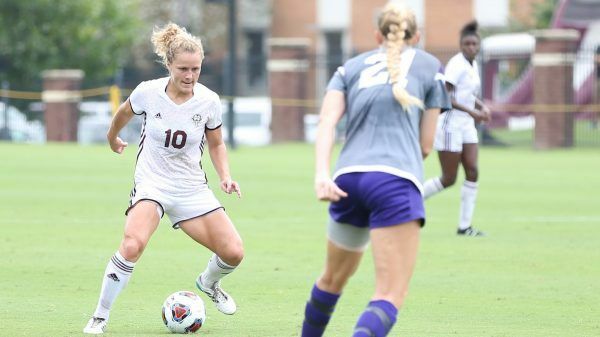 The Mississippi State University Bulldogs Women’s Soccer Elite Camp is both an overnight and commuter camp that will run from the 21st of July until the 23rd of July. It is inviting all girls in grade 7 and up who are looking to improve their soccer skills in a challenging but fun training environment. It emphasizes improvement on the player’s technical and tactical capabilities. Moreover, the registration fee is $375 for residential campers and $325 for commuter campers. Registration is on a first come first served basis. Furthermore, Check-in starts at 9 o’clock in the morning on Day 1. The program’s venue is the scenic Mississippi State University campus. It will be under the direction of the Mississippi State University Bulldogs women’s soccer coaching staff. Mississippi State University is a public, coeducational, land-grant, sea-grant, space-grant university in Mississippi State, Mississippi. It is in the R2: Doctoral Universities – Higher Research Activity category according to the Carnegie Foundation. Additionally, Mississippi State University is a proud member of the Association of Public and Land-grant Universities (APLU). It originally founded as The Agricultural and Mechanical College of the State of Mississippi. Currently, the Mississippi State University is serving around 18,100 undergraduate students. This student population has a 50-50 male and female gender distribution. This undergraduate student population is also through a selective enrollment acceptance rate of 71 percent. Correspondingly, Mississippi State University’s student to faculty ratio is 20:1. Moreover, in the 2018 edition of the US News and World Reports Best Colleges rankings, Mississippi State University is 171st in the National Universities category. It is also 90th in the Top Public Schools rankings and 151st in the Business Programs rankings. In sports, Mississippi State University’s men’s and women’s athletics teams are competing in the Southeastern Conference (SEC) of the National Collegiate Athletic Association (NCAA) Division I. They are the Bulldogs and maroon and white are their identity colors. Tom Anagnost, a native of Saginaw, Michigan is the head coach of the Mississippi State University Bulldogs women’s soccer team. He is a bachelor’s degree in political science with a minor in history graduate from Kalamazoo College. Coach Tom Anagnost is now in his second year at the helm of the Mississippi State Bulldogs women’s soccer program. Additionally, Coach Anagnost is a United States Soccer Federation (USSF) license and an Advanced National Coaching Diploma holder. Ultimately, Coach Anagnost is a two-time Mid-American Conference Coach of the Year awardee. He is also the 2002 Saginaw Valley League Coach of the Year and an inductee into the Kalamazoo College Sports Hall of Fame. Coach Tom Anagnost is the former University of Miami and the former Central Michigan University head coach. Then, the Mississippi State University Bulldogs women’s soccer associate head coach is Matt Kagan, a native of Newington, Connecticut. Coach Matt Kagan is a Southern New Hampshire University graduate with a degree in sports management. It is also where he earned his master’s degree in business administration. Coach Matt Kagan is the 2005 Massachusetts State College Athletic Conference (MASCAC) Coach of the Year awardee. And finally, the Mississippi State Bulldogs coordinator of soccer operations is Geri Siudzinski.